The Galaxy Note 7 is a huge black mark for Samsung—an exploding embarrassment that cost the company tons of money and kicked off one of the biggest PR nightmares in recent memory. 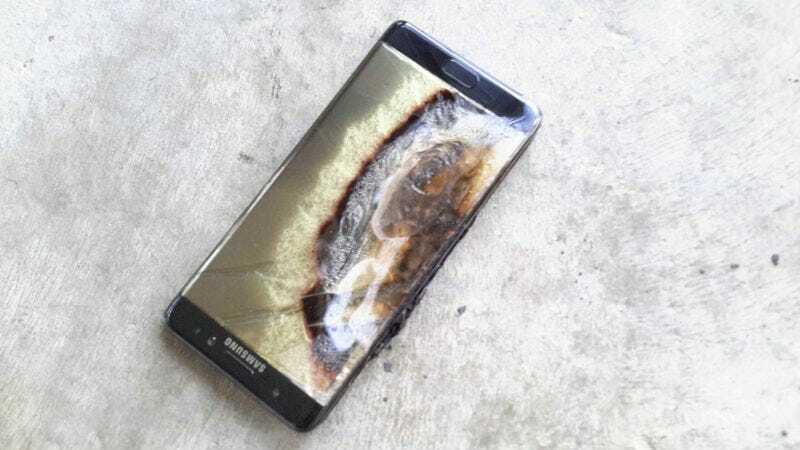 But despite the global recall, the jokes on late night TV, and the fact that the FAA and other agencies banned the phone from air travel, Samsung might sell refurbished Galaxy Note 7s in the future. That’s... certainly a choice! Back in February, reports indicated that Samsung could sell refurbished versions of the Note 7 in markets such as India and Vietnam. Today, Samsung went ahead and confirmed that refurbished Note 7s are a possibility, though it wouldn’t go into specifics. Regarding the Galaxy Note 7 devices as refurbished phones or rental phones, applicability is dependent upon consultations with regulatory authorities and carriers as well as due consideration of local demand. The markets and release dates will be determined accordingly. Note the wording in that statement: “Upon consultations with regulatory authorities and carriers.” That basically ensures that the Note 7 won’t find its way back to markets, including the United States, where groups such as the CPSC and the FAA have recalled or banned the device. When we reached out to Samsung for further clarification on the refurbish process, we were pointed back to the company’s press release. Moreover, the timing on this announcement is just bad. Samsung is going to announce its next phone, the Galaxy S8, in two days. Much of the promotion around that phone has been focused on all the layers of testing Samsung is now putting its products through, as a way of trying to reassure buyers that the new phone won’t be the disaster the old one was. You’d think Samsung would be trying to do everything it could to get us to all forget about the Note 7. Instead, it’s releasing statements about how the spit-shone phone might be sold in certain markets. So why do anything with the phones at all? Well, it seems to be about lessening electronic waste. Samsung manufactured a few million phones and getting rid of them is a complicated process. There are lots of components inside those devices that need to be disposed of in a way that won’t cause damage to the environment. For months, Greenpeace has been leaning on Samsung to publicly address how it would deal with Note 7 clean-up. In addition to refurbished phones, Samsung also laid out plans for how to recycle and process components from those devices. This is fine—responsible, even—but again, presenting the option of a refurbished phone above these other options is weird, to say the least. Samsung first recalled Galaxy Note 7 devices back in September, about a month after the phone’s US launch. After replacement phones continued to catch fire, Samsung expanded the recall and formally killed the device. In January, Samsung issued a report as to why the phones exploded in the first place. That investigation showed that while the phone itself was fine, there were problems with the batteries inside the device. Recycling is good, but maybe Samsung should just consider letting the Note 7 die in peace. The objective of introducing refurbished devices is solely to reduce and minimize any environmental impact. The product details including the name, technical specification and price range will be announced when the device is available. Samsung will not be offering refurbished Galaxy Note7 devices for rent or sale in the U.S. In a separate statement, Samsung Canada also confirmed that our northern neighbors will also not be getting the refurbished Note 7.